GnuCash 2.6.17, the seventeenth maintenance release in the 2.6-stable series of the free financial-accounting software, was released 2 weeks ago. Now you can install it via GetDeb repository in Ubuntu 16.04, Ubuntu 17.04, and Linux Mint 18.x. Relax the account type change restrictions. Prevent changing some Account Options if it has transactions. Improve the styling of the table element used for foreign currencies in the Balance sheet report so they end up aligned with the other currencies. Add ‘transaction’ to the schema and document it in gnc-pricedb.h. Also separate translatable commodity namespace strings from those used in storage. The GetDeb repository can be removed via Software & Updates utility under Other Software tab. Thank you. 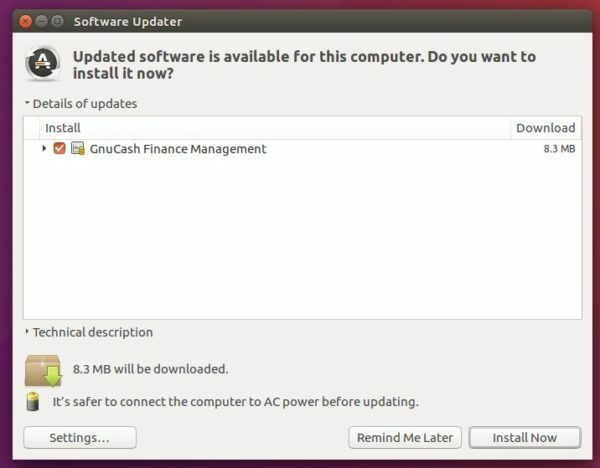 The latest version of Linux Mint 18.3 still has GnuCash 2.6.12.